film _Sleeper_ (vhs/ntsc) (1973) directed by Woody Allen, - Douglas Rain is the voice of the evil computer. Rain provided the voice of HAL in _2001: A Space Odyssey_ DVD (1968) and _2010_ (vhs/ntsc) (1984). predicted accurately the surface conditions of the moon before the Eagle landed. John Lennon once said that _2001_ should be shown every day in a cathedral. the Academy Of Motion Pictures did not nominate this film for best makeup and costume because they assumed the apes in the film were real (they weren't). instead, they awarded it to _Planet Of The Apes_ (vhs/ntsc) released the same year (1968). It is rumored that the image of the star-child came to Stanley Kubrick from the "Spirit of the Earth" in Shelley's _Prometheus Unbound_: "Within the orb itself, Pillowed upon its alabaster arms, Like to a child o'erwearied with sweet toil, On its own folded wings and wavy hair The Spirit of the Earth is laid asleep..."
Kubrick had several tons of sand imported, washed, and painted for the moon surface scenes. The chess position and moves that we see are from a game played in 1913 in Hamburg between two undistinguished players named Roesch and Schlage. According to Douglas Trumbull, the total footage shot was some 200 times the final length of the film. Clarke once said: "If you understand 2001 completely, we failed. We wanted to raise far more questions than we answered." According to Isaac Asimov, Stanley Kubrick wanted to get an insurance policy from Lloyd's of London to protect himself against losses in the event that extraterrestrial intelligence were discovered before the movie was released. Lloyd's wouldn't insure him. 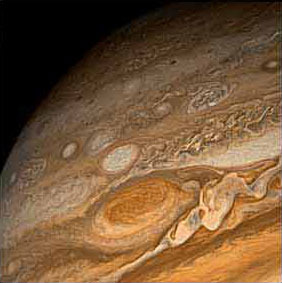 The song _Echoes_ MP3 from the album _Meddle_ by Pink Floyd can be perfectly synchronized to the _Jupiter And Beyond The Infinite_ sequence. The song runs the precise length of the sequence and was deliberately timed and arranged to follow the events occurring in this portion of the film. 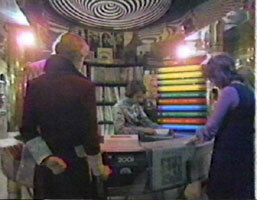 film _A Clockwork Orange_ also directed by Stanley Kubrick - soundtrack to _2001_ highly visible in record store. By the year 2001, some of the product placements had become outdated. RCA Whirlpool, the maker of the zero gravity food preparation unit on the moon shuttle, had become Whirlpool. The Bell System had been divested and the long distance service became AT&T. Pan Am had ceased operations as an international air carrier. The name David Bowman may be the an homage to Homer’s epic poem _The Odyssey_, whose hero Odysseus, was an expert archer (bow-man). 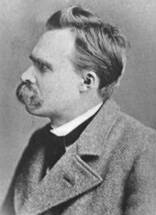 Richard Strauss’ music was based on Friedrich Nietzsche’s book _Also Sprach Zarathustra_, which concerned the teachings of the Persian prophet Zoroaster and included the idea that someday man would evolve into a "superman" or higher being. This theme is also central to 2001, making the choice of music extremely appropriate. 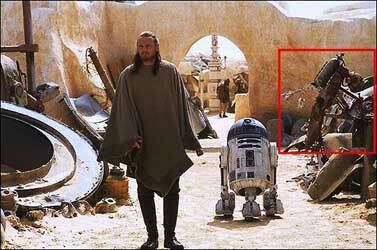 film _Saturday Night Fever_ (vhs/ntsc) (1977) - the disco where all the dancing takes place is called "2001 Odyssey"
film _Star Wars Episode I: The Phantom Menace_ (vhs/ntsc) - A pod from the Discovery can be seen behind Qui-Gon in Watto's junkyard. "And now, out among the stars, evolution was driving toward new goals. [They had] long since come to the limits of flesh and blood; as soon as their machines were better than their bodies, it was time to move. First their brains, and then their thoughts alone, they transferred into shining new homes of metal and plastic. "In these they roamed the stars. They no longer built spaceships. They were spaceships. "But the age of the Machine-entities swiftly passed. In their ceaseless experimenting, they had learned to store knowledge in the structure of space itself, and to preserve their thoughts for eternity in frozen lattices of light. They could become creatures of radiation, free at last from the tyranny of matter. "Into pure energy, therefore, they presently transformed themselves, beyond the reach of time...They could rove at will among the stars, and sink like a subtle mist through the very interstices of space." "Roger Waters (bassist for Pink Floyd), yet to balk at the sci-fi association, went so far as to say his 'greatest regret' was that they didn't do the score for 2001: A Space Odyssey -- parts of which, particularly in the long, mind-blowing hallucinatory sequence near the end, nonetheless sound remarkably Floydian..."
Plot Outline: Mankind finds a mysterious, obviously artificial, artifact buried on the moon and, with the intelligent computer HAL, sets off on a quest. 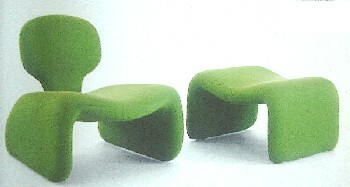 Djinn chairs designed by Olivier Mourgue, 1964-65. 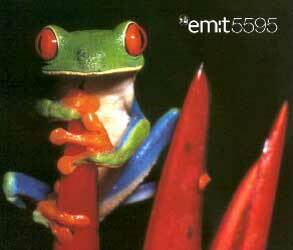 Can be seen in the space station interior in the film _2001: A Space Odyssey_ . Made of a steel frame covered with nylon stretch jersey fabric over rubber and foam. Manufactured by Airborne in France. Q: this is the question about the "great attractor" that you mentioned... did you ever see that movie 2001? Q: could the great attractor be symbolized in that movie by the monolith? Stanley Kubrick uses alchemical allegories through out the film _2001: A Space Odyssey_ DVD (1968). 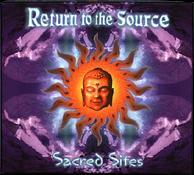 The obvious analogies are the celestial alignments that proceed each of the alchemical transmutations in the film. The second main allegory is that it is a black stone that initiates these transmutations. Again this mirrors the alchemical lore about the black stone causing the transmutation of the alchemist. Finally we get to Kubrick's ultimate trick. He proves that he knows exactly what he is doing with this trick. His secret is in plain sight. First one must remember that every time the monolith, the magical stone, appears in the film there is a strange beautiful celestial alignment occurring. 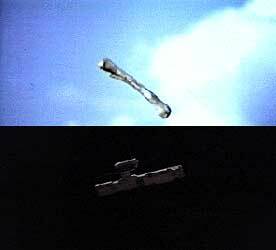 And one must remember that every celestial alignment in the film is followed by a monolith, that is, except for one. That would be the lunar eclipse that occurs at the very beginning of the film. So the question arises - if we are to stay within the rules that are prescribed in the rest of the film - where is the monolith that is supposed to follow that first alignment? The monolith itself doesn't show up in the film for ten more minutes after that first celestial alignment, so what gives here? Is Kubrick just showing off his incredible special effects? Is it just there to impress the viewer from the beginning? These things may very well also be true, but the ultimate trick of Kubrick's is embedded in the idea that the monolith must appear after every one of these magical alignments. Once again, the secret of the film is completely revealed from the beginning. There is a monolith that appears right after the opening sequence with the magical, lunar eclipse. But where is it? It is right in front of the viewer's eyes! The film is the monolith. In a secret that seems to never have been seen by anyone - the monolith in the film has the same exact dimensions as the Cinerama movie screen on which 2001 was projected in 1968. This can only be seen if one sees the film in it's wide-screen format. Completely hidden, from critic and fan alike, is the fact that Kubrick consciously designed his film to be the monolith, the stone that transforms. Like the monolith, the film projects images into our heads that make us consider wider possibilities and ideas. Like the monolith, the film ultimately presents an initiation, not just of the actor on the screen, but also of the audience viewing the film. That is Kubrick's ultimate trick. He slyly shows here that he knows what he is doing at every step in the process. The monolith and the movie are the same thing. 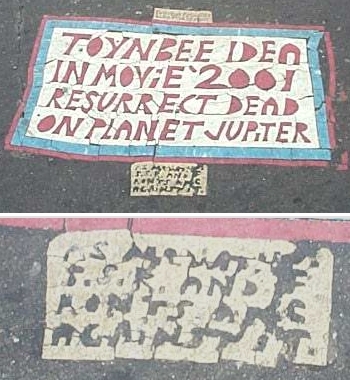 In a documentary film about the Toynbee tiles, Justin Duerr assumes that "Toynbee" refers to the 20th century British historian Arnold J. Toynbee, and that "Kubrick's 2001" is a reference to the 1968 film 2001: A Space Odyssey, a film co-written and directed by filmmaker Stanley Kubrick, about a manned mission to Jupiter. The toynbee.net website speculates that Toynbee refers to Ray Bradbury's short story "The Toynbee Convector". 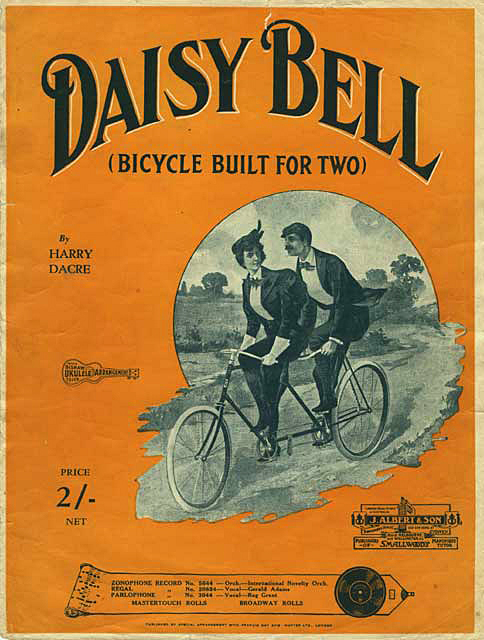 "Daisy Bell (Bicycle Built for Two)" is a popular song, written in 1892 by British songwriter Harry Dacre, with the well-known chorus, "Daisy, Daisy / Give me your answer, do. / I'm half crazy / all for the love of you", ending with the words, "a bicycle built for two". The song is said to have been inspired by Daisy Greville, Countess of Warwick, one of the many mistresses of King Edward VII. It is the earliest song sung using computer speech synthesis, in the film 2001: A Space Odyssey (1968). In 1961, an IBM 704 at Bell Labs was programmed to sing "Daisy Bell" in the earliest demonstration of computer speech synthesis. In 1974, auditory researchers used the melody of "Daisy Bell" for the first demonstration of "pure dichotic" (two-ear only) perception: they encoded the melody in a stereophonic signal in such a way that it could be perceived when listening with both ears but not with either ear alone. 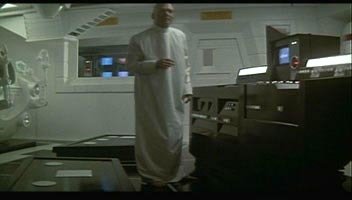 Science fiction author Arthur C. Clarke witnessed the IBM 704 demonstration and referred to it in the 1968 novel and film _2001: A Space Odyssey_ (avi) , in which the HAL 9000 computer sings "Daisy Bell" during its gradual deactivation. It is this very same connection to which the song most likely owes its appearance in the film, _The Theory of Everything_ (avi) (2014), a drama about the life of the world renowned physicist Stephen Hawking, whereupon the fictionalized Hawking types out part of the song's lyric, in order to have the words subsequently "spoken", utilising his iconic text-to-synthesised-speech device. 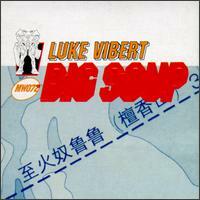 The tune was played as the lead-in to Aunt Daisy's radio broadcasts in New Zealand, which ran from 1930 until her death in 1963. In the This Is America, Charlie Brown episode The NASA Space Station it is sung by Peppermint Patty while demonstrating an exercise bike on the station. In the Doctor Who episode " Dinosaurs on a Spaceship" (8 September 2012), Solomon's robots sing the first line of the song when deactivated by the Doctor. In season four, episode 11 of Futurama, titled "Love and Rocket," Bender sings the song over a montage featuring a romance he had with the Planet Express Ship. 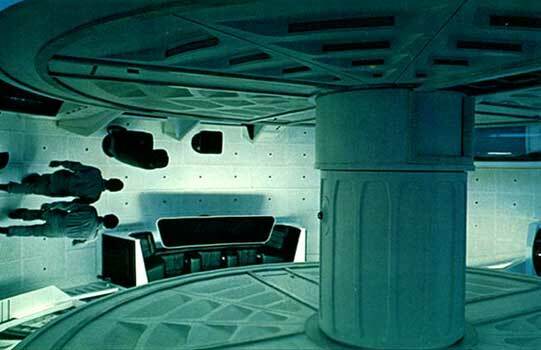 The episode is inspired by the film 2001: A Space Odyssey. In the finale of American Horror Story: Apocalypse, Ms. Mead's (Kathy Bates') robotic head sings the song as it shuts down, after Cordelia (Sarah Paulson) causes her body to explode. n season 2 episode 10 of ‘’Future Man’’, a holographic conscious upload of Stu (Haley Joel Osment) sings this song while (“The Pointed Circle”) are making an attempt to shut him down. In the 2005 novel Anansi Boys by Neil Gaiman, one of the characters is named Daisy because her parents own and ride a tandem bicycle. 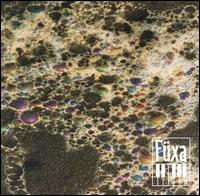 probably taken from David Bowman's line in _2010: The Year We Make Contact_ (vhs/ntsc) - Floyd: "what's going to happen?" Bowman: "something wonderful..."